Every year, its customary in our part of the world to prepare a sweet-milk dish on the day of the Pongal festival, which usually happens in January. As per customs, turmeric plants are tied around the vessel used to prepare the dish. 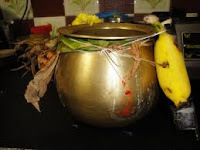 This time, we had the double joy of reaping a good harvest of the turmeric plant in the home garden and using the same for tying around the sweet-milk dish vessel. The joys of home gardening are really wonderful! Vow. I love your customs and traditions. India is a fabulous country. Will follow your blog regularly to read more. very interesting article about turmeric plants and well explained great keep going and like to read more from you thanks. interesting article,nice way to make sweet milk. Its very interesting & informative article thanks for your post.. keep it up..